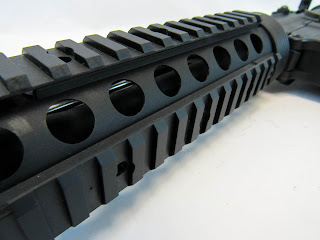 On the 1st of February, I was invited to visit Nuprol HQ in the quaint town of Epsom, by Danny and Rossco to chat about what 2016 and beyond looks like for one of Europe's biggest Airsoft brands and see/test some of their new products! I was very warmly welcomed by the lads (who happen to be a powerhouse of a management team) and the day started. After a cup of tea and a quick chat, my day started with a tour of the premises - 2 units worth of office and warehouse space filled to the brim with everything WE and Nuprol (it's a bit like being a kid in a candy store!). Due to the rapid growth of the business, they have just acquired an additional unit to expand operations into which is fantastic! Nuprol is a British brand and all operations except manufacturing are done in house from graphic design to distribution - something UK Airsofters should definitely get behind, shop local and supporting British Airsoft companies. 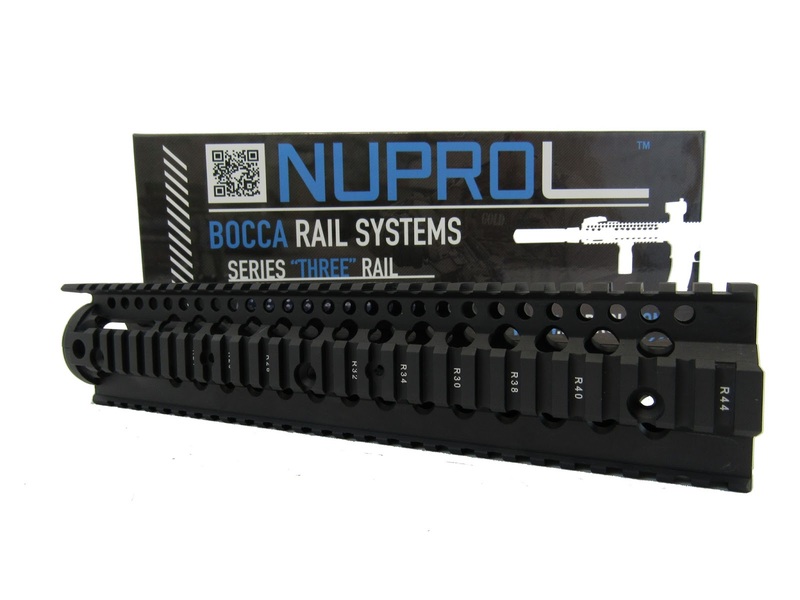 There were a few things I was really interested in discussing with Rossco, the Marketing Manager, which included the new Nuprol Rail Systems, the changes to Nuprol Gas and their PMC clothing range. Firstly lets talk about the team, I have had the pleasure of meeting Rossco at last years RedWolf showcase, but I was yet to meet the rest of the team that make Nuprol. I was warmly welcomed and felt very at home - it's obvious from the atmosphere at Nuprol HQ that the team love what they do and are a family, from the consideration they show each other (even the managers make tea!) to the banter flying around the office. The first item on the agenda was the new range of Rail Systems that Nuprol have just brought out! 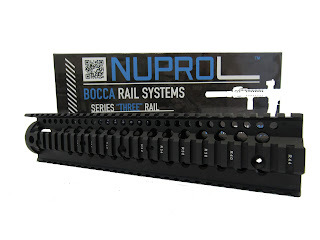 The new Bocca Rail Systems are the newest addition to the Nuprol range. Rails are a piece of kit that are usually very expensive so when I was told the price points of the various series - I was a little taken a back with some starting as cheap as £39.99 (please do check the various retailers for actual prices! Pictured is the Black Series 3 12" Bocca Rail that retails at around £65) Nuprol's mission with these was to simplify them but still make them look awesome! 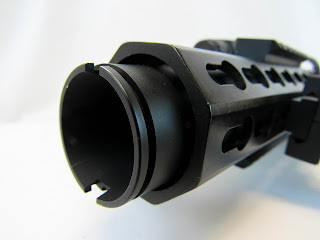 The finish on them is fantastic and they fit most AEGS and GBBRs and even come with 2 screws so they can be used on both - there are 3 series of Bocca Rails, each with distinct packaging. They come in 7'', 9'' and 12'' and in either Black or Bronze. 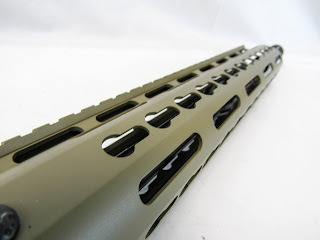 My personal favourite definitely had to be the 7'' Series Three Rail in Bronze (pictured left) - which you will be seeing on a new build of mine soon, so keep your eyes on my IG feed to see updates on that! One thing worth mentioning is definitely that they come with everything you need to fit them with - a definite bonus! Next on the list was Nuprol's range of gases. 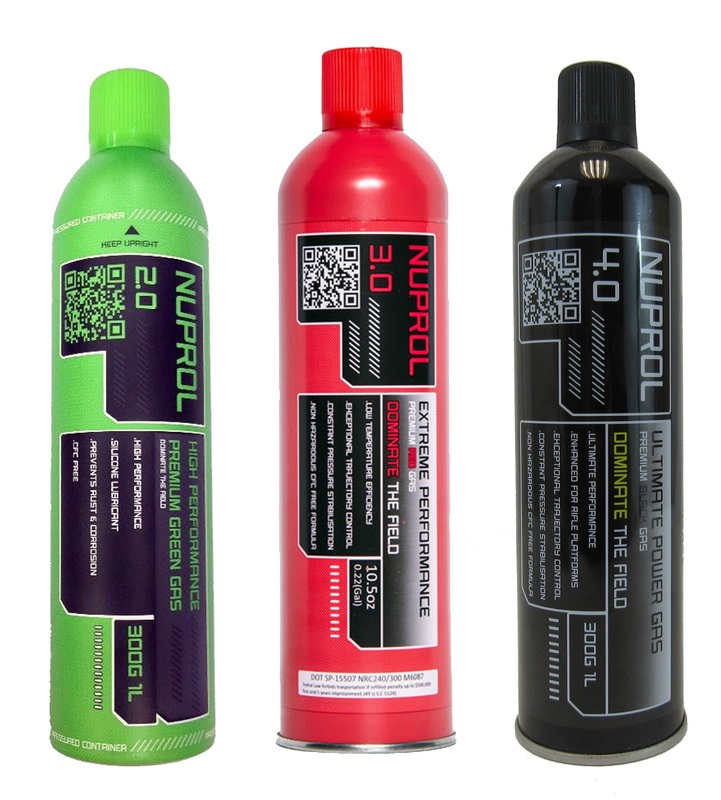 Nuprol has the most comprehensive range of gases in the industry and there's more to come! Nuprol currently do 3 different gases designed for everything and anything. 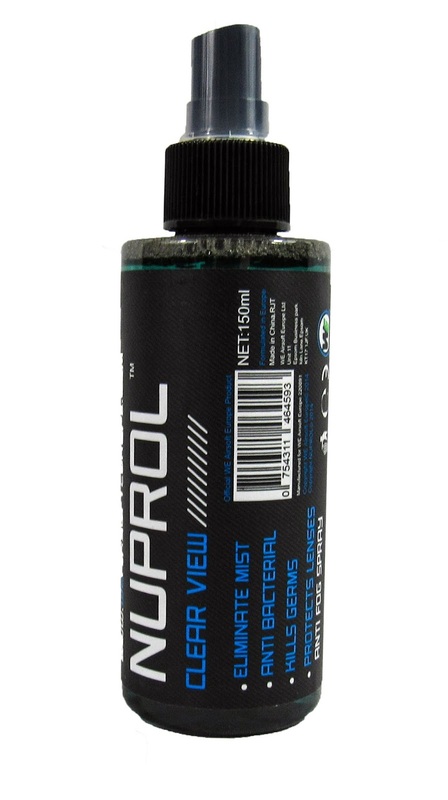 Nuprol 2.0 (Green) is their 'everything' gas and is perfect for the summer months, although it is not recommended in plastic pistols it is pretty much safe in anything. This is the direct replacement for the WE Europe Premium gas and is a cleaner, more refined formula. 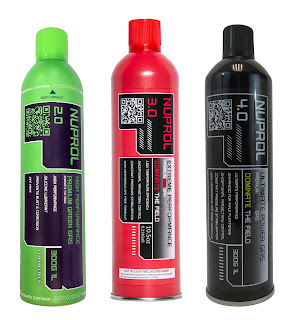 Nuprol 3.0 (Red) is the gas that is specifically designed for cold weather - I use this gas all year round. 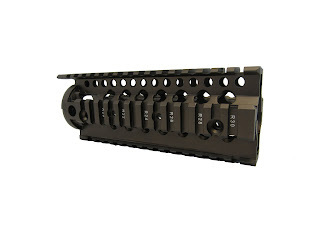 It works best in metal pistols and GBBRs. In comparison to WE's original gases - the performance is much better! And finally Nuprol 4.0 (Black) is gas specifically for GBBRs and ISPC. It can be used in metal pistols in very low temperatures but this is not advised because of the power of 4.0, it will reduce the lifespan on the pistol. Nuprol's 4.0 improves the cycle rate of GBBRs dramatically - without a drastic increase to FPS. The Nuprol gases now come in an improved container that is a higher quality and a new shape with new artwork, I personally think the shape is much more ergonomic and user friendly. Anyone who has seen me load my pistol mags will have noticed that the old canisters were a little too large for my small hands haha! The new thinner bottle means it is easier for me to fill my mags - a big thumbs up from me! There is however a small size difference of 150g from the old canister to the new, but there is a drop in price that reflects this. Another product Nuprol kindly supplied me to test is their XL Speedloader. 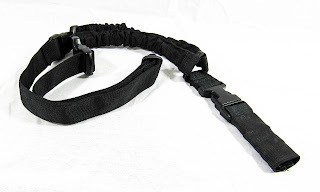 What I really like about this speedloader is the size and shape and that is the first thing that strikes me about it - it is a 1:1 scale of an AR mag and fits M4 and M16 style mag pouches, as it holds 470 BBs it's brilliant for stashing in a pouch and refilling on the field! The capacity means I can fill all my midcaps and pistol mags without reloading the speedloader making the job a little quicker! One thing I have noticed about standard speedloaders is they don't last very well because of the plastic they are made of, I am excited about this one however because it is made of Lexan which should improve the longevity by miles - these are my first impressions but it will definitely be a product to revisit in the future to report back on its longevity. 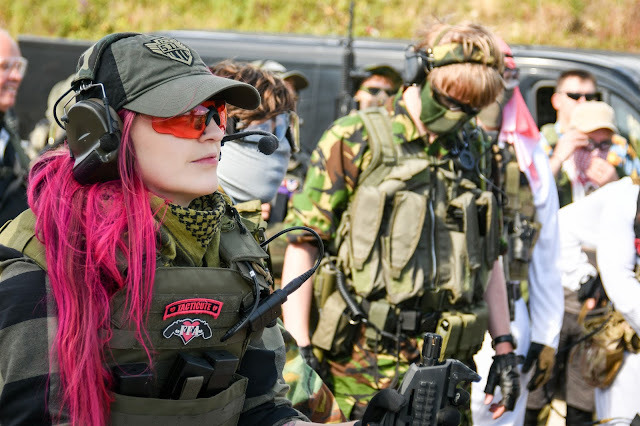 As a former Fashion designer, I have a massive affinity towards kit and I love gucci gear - but the Nuprol PMC range did catch my eye whilst in my local Airsoft store so I wanted to get the lowdown on it, it turns out that Nuprol have spent the last year working on developing a range of high quality, affordable Airsoft specific kit in the styles that Airsofters love without them having to spend the dollar on real world military kit! 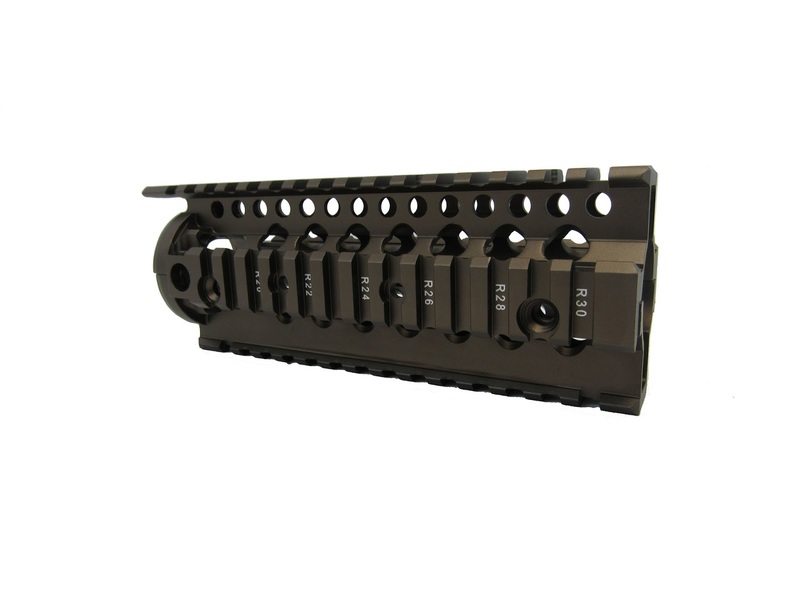 Now I won't be swapping my Warrior Rig but this range is definitely what Airsoft needed - that middle ground in kit. 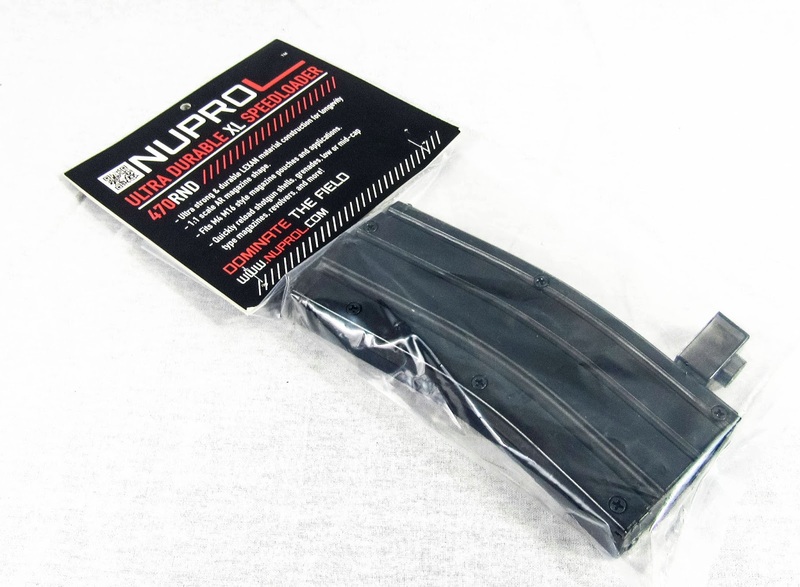 It is made from a material dubbed 'NP1000D' which is durable like motorcycle armour but retails at an affordable price, for example the M4 Open Mag Pouch retails at around £13 which is incredible. The lads kindly supplied me with a PMC Day Bag in Green ready for my new Green MilSim loadout which I will be reviewing soon! So keep an eye out for that! Last on the agenda was their range of eyepro and face pro. The mask I wear has become a signature to my loadout so I was very pleasantly surprised to see they made a half mesh face mask in that design and upgrade to it! Now mesh is my preferred eye/face pro but I am aware of the risks that are associated with it and by no means saying that you should definitely wear mesh - eye/face pro is a very personal descision. Nuprol's range however stands heads and shoulders above the ACM (All China Made) versions you can pick up off of eBay - they're the only mesh goggles with a CE rating! Both pieces meet all the European safety standards whilst keeping in line with the accepted styling. Their mesh goggles cost around £12 for the style I'm wearing in the above picture and £15 for the large version - the large version has a brace bar in the middle which you can't see whilst wearing them for even distribution of pressure and the coveted CE rating. The holes in the mesh are just the right size to let more light in but retain that level of safety. Now if you don't use mesh, Nuprol do have a solution to fogging - I am yet to test this on the field but from my home testing (yes my mother did think there was something wrong with me walking the dog in them haha) the product is promising. When I wear my shooting glasses I usually use washing up liquid on them, but still find I have issues with fogging towards the end of a game day. 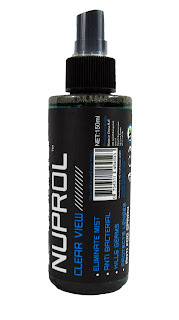 I have heard many good things about Nuprol Clear View and the fact it is antibacterial is a major plus for me! I'm really looking forward to testing this on sunday so this will also be a product to revisit at a later date! So what does the future look like for Nuprol? Lots and lots of growth! 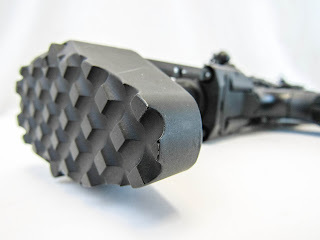 They have over 50 new product lines that are launching in 2016 including: Silencers/Suppressors, Shotgun shells, metal HiCap mags, metal Flash mags, bipod grips, standard forward grips and forward grips with pressure plads, AK folding grips, rubber RIS rail covers, AEG/GBB sling plates, AK scope mount, standard scope mounts along with a fair few more goodies! PMC this year will also be huge! I'm really excited to see these new developments within the Nuprol brand! Here's something from them I am VERY excited about but I'm sworn to secrecy, Rossco and Danny however did let me take a few sneaky pics for you though! Stay tuned, and for more teasers, you can stay up to date on Rossco's and Danny's Instagram accounts - just click the link :) A massive thank you to the lads for a great day at Nuprol HQ!